ClaDun X2 has you constantly feeling like you’re just moments away from something spectacular, but often leaves you wondering where things went wrong. It may have stood out on the PSP but, in the crowed PC marketplace, it’s simply another average game. ClaDun X2 contains everything I really ask for in a game: tons of customizable content, a retro 8-bit feel and a story that doesn’t take itself too seriously when dealing with ridiculous concepts. But, for some reason, I simply can’t get engrossed in it. I always feel that I’m just missing out on something, or that I’m just another level away from unlocking something that would turn this into the game I’ve been looking for. That’s really the story of the game though as, no matter what happens, I’m always just a few steps away from what I really wanted. 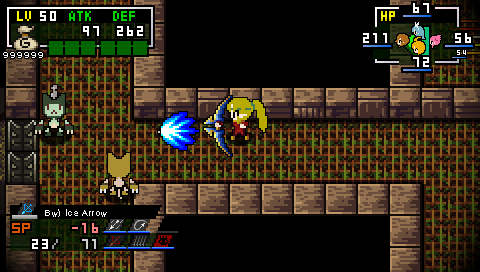 ClaDun X2 is a dungeon crawler at its very core. You’re tasked with making your way through a series of increasingly difficult dungeons filled to the brim with traps, baddies and, most importantly, loot. Along with the primary goal of surviving the challenge, you’ll also have to race through environments in an attempt to beat the clock, which will earn you “fame”. As you accrue more fame during your journey, more bonuses will be unlocked throughout the town, allowing you to purchase more classes, change jobs and/or choose from other assorted unlocks. Don’t be fooled by the lenient difficulty of the early dungeons; attempting to race through the level without being properly equipped is an easy recipe for disaster. The floors of the dungeons are littered with traps that you won’t be able to see until you’re almost standing on them. For the most part, the traps will spit out some sort of projectile, meaning that you can try to use it to your advantage by kiting an enemy into it. Healing traps work the same way, so you’ll want to make sure you don’t accidentally heal that monster you’ve been trying to take down. After you complete a series of dungeons, you’ll be treated to a cut scene that will advance the story a bit. The basic premise is that your character has appeared on Arcanus Cella, a mysterious island in a pocket dimension that has no escape. The cutscenes are akin to what you’d expect from a b-reel horror film – the dialogue is a bit campy and is filled to the brim with tropes from JRPGs. It’s largely forgettable on the whole, but luckily there is no penalty if you choose to ignore the story completely. While ClaDun X2 fails with regards to its story content, it certainly makes up for it through the use of Magic Circles and an interesting job system. You’ll have to create some new characters fairly early into the game and, as your main character levels up, you’ll unlock new Magic Circles based on their job. These circles take some getting used to, but are absolutely integral to your survival. The system can become fiendishly intricate as you progress through the game. You’ll have to plan out exactly which character to put where and with what bonuses in order to maximize your abilities. They’ll also take damage meant for you if you’re attacked in their direction, but be warned; if they die you’ll lose any stat bonuses they offer. It wasn’t until I discovered the Ran-geons that I actually had any vested interest in the game. The randomly created dungeons offered just the spark I was looking for, and created an atmosphere unlike anything I had really experienced before. 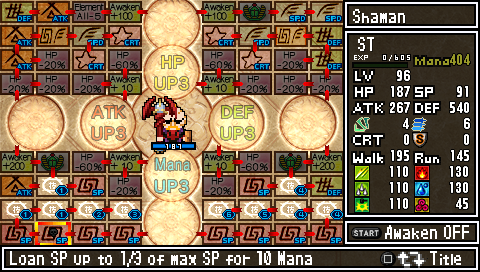 With Neo-geons, you’ll have to dig through 99 randomly created levels with massive risk/reward implications. At the end of each level, there will be a variety of gates that will have different effects. The drop rate, as well as the monster level, will be rolled for and, depending on which type of gate you took, the odds will be shifted. 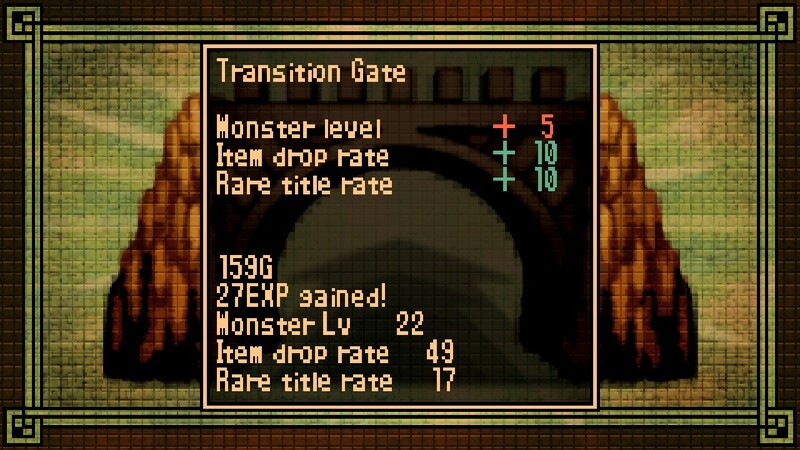 An angel gate will limit the monsters to only moving up one or two levels while adding up to 10 on the drop rate, while a hell gate can lower your drop rate by upwards of 20 while adding 50 to the monster level. And, just like in standard dungeons, if you don’t make it to one of the exits that can randomly appear before you die, you’ll leave empty handed. If that wasn’t complicated enough, Tri-geons ratchet up the insanity by offering interconnected paths. You’ll have to transverse through normal and chaos levels for a chance to enter the heaven levels, which offer increased loot drops and easier enemies. You’ll have to switch between the three often as the level gates offer you limited options and you’re often forced to put yourself in a bad situation with hopes that it’ll lead to a better one down the road. There’s really no getting around this one: the game settings are utterly abysmal. I don’t mind if a game has limited user options by default, but I don’t think it’s too much to ask that they work. The V-Sync option is on by default and, as far as I can tell, it does nothing but flicker your screen. You’re also limited to your choice of three resolutions: Normal (which is too small to be useful to anyone) Enlarge (about twice the size of normal, but still not very useful) and Full Screen, which stretches everything out. The control scheme is fairly daunting right off the bat. While trying to maintain a control scheme reminiscent of what you’d find on the PSP, the game is fully controlled via the keyboard. It takes a bit of getting used to in order for the two-handed method to feel comfortable but, to the credit of System Prisma, it is completely customizable through the menus. It does recognize gamepads as well, and I found that method to be much easier in the long run. ClaDun X2’s world is presented in a retro 8-bit style which, thanks to the stretching that occurs with its full screen resolution, honestly doesn’t look great even by those standards. It’s not hideous by any stretch of the imagination but, after looking at some of the characters, I couldn’t shake the feeling that something was just off. 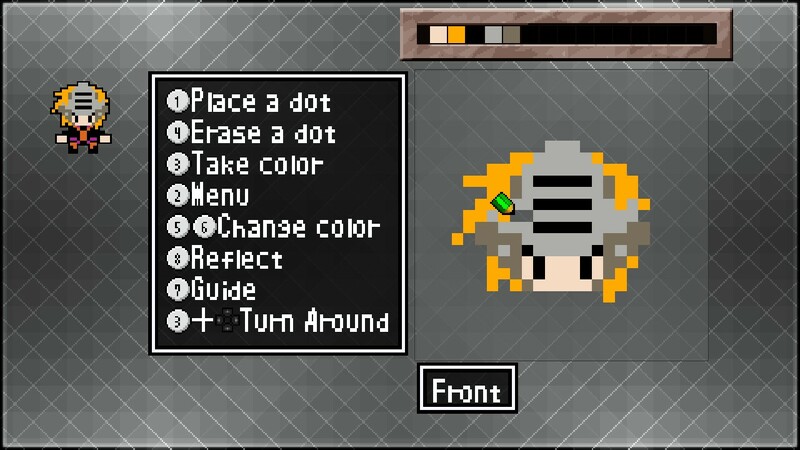 One of the selling points in ClaDun X2 is the customization available. Players have the ability to completely retool the look of their characters. While I personally don’t have the slightest bit of artistic talent in my body, I know there are people out there who do. It only took a few minutes on Google before I found a few .bmp files that took my awkward looking ranger into a pixel perfect representation of Link from The Legend of Zelda: The Minish Cap. It’s extremely easy to import or export these files, so those of you looking to spice up your characters a bit should have plenty of options down the road. The soundtrack is a prime example of the game being on the right track but stopping short. The tracks are extremely catchy in their own right, and you have the option of listening to them in either Real or Retro style, which completes the 8 bit feel of the game by turning all of the tracks into chip tunes. Unfortunately, the limited tracks don’t offer much in the way of variety, and it wasn’t long before they started to grate on my nerves a bit. I want to make special note of the fact that there is no auto save feature to be found within this game. However, it’s not a huge issue in the long run since saving only takes a few buttons, but this really should be a standard feature by now. ClaDun X2 is a game I’m enjoying, but for all the wrong reasons. I have no interest in completing the paper thin story, and I’ve long since abandoned the main dungeon line in exchange for a series of suicide runs through Ran-geons, in order to see how far I can push my under-leveled characters each time. I imagine a lot of the mechanics found here would be much better-suited on the original PSP platform, as the game’s pick up and play style would be a perfect diversion from a long commute or an elongated wait time. However, it simply can’t compete within the existing marketplace for lengthy and immersive mouse and keyboard-using titles. Still, I can’t completely leave it behind. Just like my characters, I’m stuck in Arcanus Cella, for better or for worse.